April 18th at the Columbus Idea Foundry from 5:30-7:30, sponsored by CoverMyMeds. The Spring Arts Gala will feature performances and demonstrations by: FPA Robotics, Steel Band, Karate, Songwriting, Jewelry Making, Art, Yoga, Videography and Cooking Classes. Franklinton Preparatory Academy is a tuition-free public charter high school for grades 9-12. Located in the heart of Franklinton, FPA is committed to developing trusting relationships within and among the members of our learning community. With a distinct focus on creative arts and bringing in outside experts to enrich student life, FPA has seen students accomplish amazing success. I’m looking forward to my upcoming years at FPA; I wouldn’t want to spend them anywhere else! Students choose Franklinton Prep because we create a physically and emotionally safe environment for students, faculty and guests. Diversity is an essential component to creating a school environment that is engaging, invigorating and reflective of real life. Students are engaged in all aspects of school life. From dictating curriculum to choosing the next science experiment, students are engaged to excel through active participation. 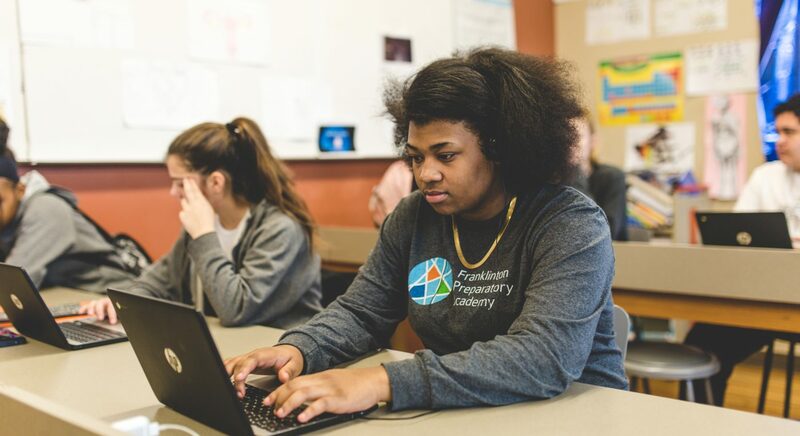 Franklinton Prep manages human and financial resources responsibly, maximizing the investments of time, energy and resources contributed by our faculty, partners, and partners. My son was so behind the second half of the junior year that I was worried that he wouldn’t graduate. The great program and caring teachers and administrators has helped him so much that he is graduating this year with a GPA that puts him in demand for scholarships!! Thanks so much FPA! "SO WHERE DO I START?"